Scriptographer is only supported by Adobe Illustrator CS5 and under. This is not a comprehensive tutorial - it was meant to walk you through a hands-on example in about 15 minutes, so you get a general idea about what Scriptographer can do. No programming skill is required in this tutorial. We'll be creating the sunflower-like attern (Fermat's Spiral), using several open-source scripts shared by Scriptographer community. Scriptographer is a scripting plugin for Adobe Illustrator. The setup is quite simple: download the file and drag it to your ~/Adobe Illustrator CS*/Plug-ins/ folder. More details in the official installation instruction and the execution basics. During the installation, you'll be prompted a dialogue asking you to create a folder to store your own scripts. Scriptographer recommends to create the folder in the root Documents folder. Let's call the folder "Scripts". Save the *.js file to the Document/Scripts folder we just created. Then open Illustrator, create a new file and set the Artboard 1000 by 1000px (or anything that's a square). Then go to the menu/Window/Scriptographer/Show Main Palette, calling out the Palette window, shown below. he main palette is a folder of scripts. Scriptographer came along with a wonderful set of ready-to-use scripts. You can watch the screencast here to see how they're used. For this particular tutorial, we'll focus on the scripts in "My Scripts" folder. 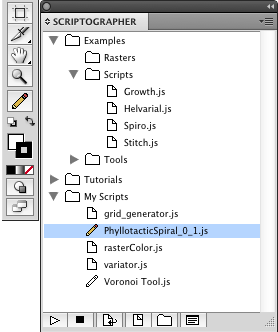 Select the Phyllotactic Spiral script (highlighted), then click the "Play/Execute" button at the lower left corner. We'll see a "pencil" icon highlighted in the Tool Bar, at the same time, a dialogue window was brought up. Set up the parameters in the Phyllotactic Spiral as shown on the left. Then select the "Pencil" tool from the tool bar, and click anywhere in the Artboard. In a few seconds the script will generate an array of points looking like the one below. You need to hit Cmd + A (Select All) to see all the points, because they don't have any dimension. Adjust the overall size of the set, so that it's slightly smaller than the Artboard, and make sure it's positioned in the center. et's change gear. Go to the Scriptographer Main Palette, choose "Voronoi Tool.js" from "My Scripts". Keep all the points we generated in the previous step selected, click "Add Selected Points" from the Voronoi Tool dialogue. Voronoi Tool is a lot of fun. It takes the Artboard bordersa as its boundary, then create cell-like shapes based on points we defined within the Artboard. 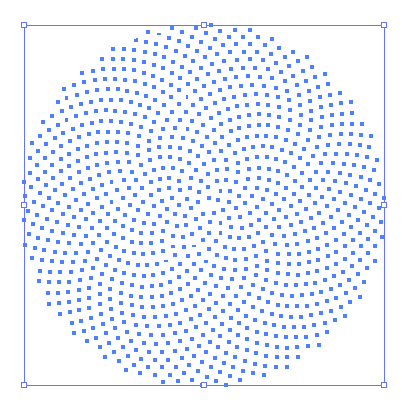 To learn more about Voronoi Tool, watch this screencast. or the design I wanted, I went in the "sunflower" group and deleted all the "petals", left only the "seeds". Then I colored them all a light purple. Change gear again. We'll use the "Variator.js" under "My Scripts" this time. 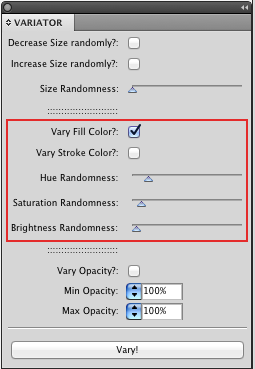 Variator can be used to randomize the size, the fill color, the stroke color or the opacity. For this tutorial, we'll only randomize the fill color. Hope you enjoyed this quick walk-through, and found Scriptographer interesting and easy to dive in. When I first came across Scriptographer I thought I would never learn how to write the scripts, and I would just browse their script pool and use what was already made. But try look into their well documented tutorials - It's in fact not that hard to write up some easy scripts for your own convenience. I wrote the Grid Generator, Variator and Raster Color, which are all spin-offs from my own design needs. It's fun!